Falafel was introduced to me by my son, since lately it’s been his favorite lunch served with garden salad. I was convinced that I would like this food as well, so decided to research some recipes, and prepare a batch for my family. 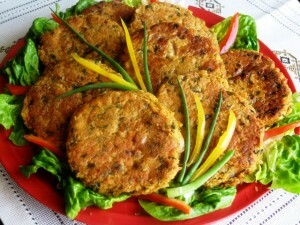 Today I will share the final recipe, and assure you that if you like vegetarian food, you will LOVE these. These are not your typical falafle…round and deep fried….these are much lighter, since they are baked. The main ingredient is chickpeas, which is a super protein food, hence replacing the traditional need of meat to create a delicious lunch, or light dinner. Falafel may be formed into patties or balls, and served not only with salad, but also with your favorite dipping sauce, inside a pita, or even over nachos….drizzled with some melted cheese, of course. This recipe yields 8 burger-size patties. In a large bowl, mix all ingredients, to incorporate evenly. Scoop 1/2 cup of mixture at a time, and form patties. Heat a frying pan with 2 Tbsp. of canola oil. Fry patties 2 minutes per side, turning once. Remove from a frying pan, and place on a foil lined baking sheet. Bake in preheated oven at 350 degrees F, for 10 minutes per side. Remove, and cool slightly before serving. Cool completely before storing in the fridge, or freezer, for future use.